The epicenter for the 8.2 earthquake that rocked Chile on Tuesday was approximately 310 miles (500 km) from the Very Large Telescope and ALMA. The massive earthquake that struck Chile on Tuesday (April 1) left three main European-built observatories in the region relatively untouched despite causing damage and a tsunami along the country's western coast. The powerful 8.2-magnitude earthquake struck about 60 miles (95 kilometers) northwest of the coastal city Iquique, causing several landslides and triggering a tsunami that rose some 7 feet (2.1 meters). The earthquake struck at 8:46 p.m. local time (7:46 EDT). A powerful 7.6-magnitude aftershock rattled the area late Wednesday night (April 2). 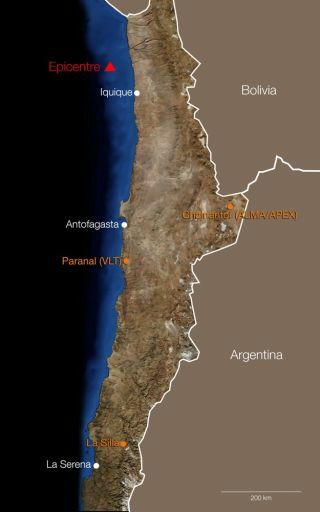 The epicenter was located approximately 310 miles (500 km) from both the ALMA/APEX and Paranal sites. "The quake was felt at the ALMA camp as a prolonged swaying, which lasted for about 2 minutes," the ALMA Observatory said in a statement. However, none of the ESO facilities reported any damage. No casualties were reported among ESO staff, but many with friends and family in the harder-hit regions of Iquique and Arica, another city close to the earthquake's episode, were affected. The ESO reports that all staff on site has been able to contact their family. "ESO expresses its deepest condolences to the families of the victims, and its sympathy and support for all those affected by the statement," the organization said in a separate press release. A larger 8.8-magnitude earthquake that struck Chile in 2010 also left the observatories untouched.